The soup and stew season is upon us again — time to savour chervil, a stalwart for winter use, and one which deserves to be grown more widely. Chervil enhances all basic winter standbys, such as casseroles, soups and stews, as well as some of our favourite cheese and egg dishes — it makes a great substitute for parsley in scrambled eggs. It’s also one of the best culinary herbs for making herb butter because of its clean, fresh flavour. 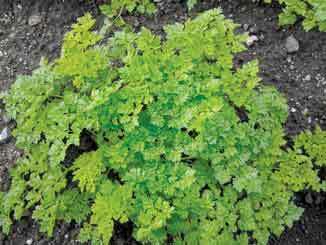 Often called French parsley, chervil (Anthriscus cerefolium) is a winter annual, which grows to a height of 25–38cm, and is best sown in autumn as the weather starts to cool down. It’s long, thin black seeds, 6mm long and enclosed in a case until ripe, resemble small arrows. They’re best sown directly into the patch where they’re to grow, but can also be sown into trays, covered lightly with potting mix and seedlings pricked out two to three weeks later — ripe seeds germinate rapidly. Chervil will soon let you know when it’s unhappy — leaves turn pink and white if growing conditions are too hot, and it will quickly run to seed. Although hardy, some protection, such as a cloche, may be needed during very cold spells. As with parsley, harvest the young leaves for the best flavour. The tiny, delicate flowers, which taste of sweet aniseed, can also be eaten — try them as a garnish on salads and soups. Chervil is traditionally used as ‘fines herbes,’ the French technique of using a selection of finely chopped herbs, which also include parsley, chives and French tarragon, to sprinkle over dishes like cooked vegetables, soups, salads, white fish and egg dishes, just before serving (to avoid flavour loss). 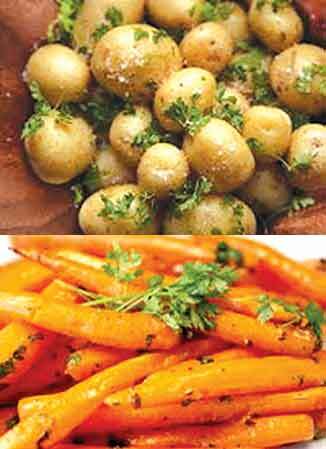 Chervil, with its hint of anise, is certainly best added at the end of cooking. Although the herb doesn’t dry well — flavour is reduced — you can freeze in ice-block trays so you have some on hand during summer. Just add to trays, fill with water and freeze.